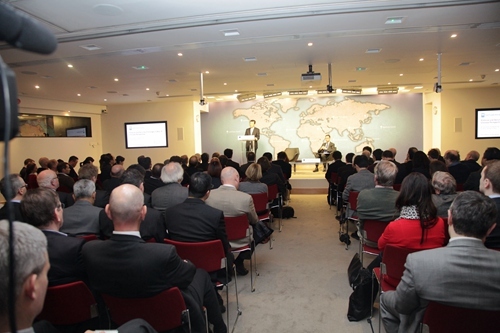 It is a real pleasure for me to return to the Chatham House on a special occasion. This year marks the centenary of the First World War. As you will know the founding of Chatham House was largely attributable to that war. Then as now many people were searching for a rationale to prevent such wars. In 1919 British and American delegates attended the Paris Peace Conference where post-war international order would be discussed. These representatives conceived the idea of an Anglo-American Institute of foreign affairs to study international problems with a view to preventing future wars. 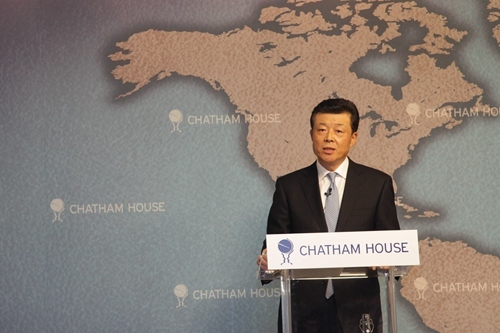 That institute, better known as Chatham House, is now among the world’s most prestigious and influential international affairs think-tanks. This history means we are gathered in a most fitting place to discuss Asian stability and development. It means we can draw on the very foundations of Chatham House for wisdom and insights. Some people say the 21st century is the Asian century, as the 19th was the European century and the 20th was the American century. Perhaps it is too early to tell if the 21st is the Asian century. But, one thing is for sure. Asia is increasingly becoming one of the centres of international attention. In turn, there are three questions frequently asked about Asia. First, is today’s Asia like Europe on the eve of World War I? As the centenary of World War I approaches, both political and academic circles are reflecting on that past. Some have compared today’s Asia to pre-World War I Europe. Many of these analysts argue that Asia is facing rising conflicts. These are compared to relations between nations in Europe a hundred years ago. In recent years there have been escalating tensions among Asian nations. These issues concern history, military issues as well as land and sea boundaries. So the analysts reason that it is very likely that Asia will end up in conflict and war just as Europe did in the late 19th century. Japanese Prime Minister Shinzo Abe himself drew an analogy between current China-Japan relations to Anglo-German relations before World War I. However, if scholars believe in this view, I would say they are not seeing the ‘wood for the trees’. If a political leader supports such arguments then one must be suspicious of his real motive, because the facts simply do not support the views of Mr. Abe. Then what are the facts about Asia? The basic fact is Asia enjoys a generally stable situation today. Peace, development and cooperation are still the prevailing trend. I will use three words beginning with ‘S’ to present you an analysis of Asia. The first word is Stable. · The China-Russia strategic partnership of cooperation is deepening. · China and the US are committed to building a new power relationship featuring non-conflict, non-confrontation, mutual respect and win-win cooperation. · Practical cooperation between China and ASEAN countries has scaled new heights. The second word is Shining. In global economic and financial landscape, Asia has been shining while other regions dim. The role of Asia in powering world economic recovery and growth has become an accepted trend. This has come from emerging economies in Asia maintaining fast growth. This makes Asia the world’s most dynamic and most promising region for sustained economic growth. The IMF figures show that in 2013 Asian emerging economies grew by 6.3%, more than two times of the average world economic growth. The volumes of trade, foreign exchange and inbound FDI of Asia-Pacific all made up half, or better than half, of the world’s total. The third word is Solid. Regional cooperation within Asia enjoys a solid foundation. The content of such cooperation has been enriched. The quality has been raised. The cooperation has become regular and institutionalised. Thriving regional cooperation and exciting prospects will boost the growth rate and quality of Asian advance. One driver is trade agreement. Here, Asia leads the world in free trade arrangements. In addition, Asia has made great advances in regional economic integration, transport connectivity and security cooperation. At the same time Asia also has some security challenges to tackle. These challenges have various causes. Some are legacies left over from World War II and the Cold War. Some arise from historical issues. Other challenges take the form of unconventional security challenges. Examples are natural disaster, trans-national crime, cyber security, energy security and food security. It is worth a special mention that some Japanese political leaders, especially Mr. Abe, have taken blatant steps to deny Japan’s aggressive past. The evidence is denial of outcomes of the anti-fascist war. Also, challenges to the post World War II international order based on the UN Charter. These actions have caused tensions between Japan and its neighbors. The result threatens to become the biggest destabilizing factor in Asia. However, on balance, peace and development remain the theme of the times. Political, economic, cultural and security cooperation among Asian countries has never been closer and more effective. Such cooperation is still growing. Certain country’s attempt to derail Asian stability has been condemned by Asian countries and the entire international community. Such attempts are doomed to failure. For these reasons, today’s Asian situation is starkly different from the rivalry between nations in Europe before World War I. Let me now turn to the second question frequently asked about Asia today: That is, what are the changes in China’s Asia and neighborhood foreign policy under new circumstances? Asia is China’s neighborhood. It is critical to China’s development and prosperity. China is deeply committed to friendly relations with its neighboring countries. China’s foreign policy places top priority on neighboring countries. The more developed China becomes, the better China appreciates the value of a peaceful and stable neighborhood. · Build good neighborly relationships and partnerships with neighboring countries. · Develop an amicable, peaceful and prosperous neighborhood. · And stress affinity, sincerity, mutual benefit and inclusiveness. These principles have opened a broader prospect for China’s neighborhood diplomacy. · First, continue to build good-neighborly relations and enhance political mutual trust with neighboring countries. China and its neighbors enjoy geographic proximity and close people-to-people exchanges. We have supported each other in times of need and shared weal and woe. Good-neighborly friendship and win-win cooperation is the hallmark of Asian countries’ relations with China. After taking office, both President Xi Jinping and Premier Li Keqiang chose neighboring countries for their first overseas trips. In the past year, China exchanged visits with 21 neighboring countries at summit and Premier level. This shows high level exchanges between China and its neighbors have reached out to almost all its neighboring countries. Going forward, China will do more to earn friendship and trust of its neighbors. We will have regular exchange of visits as we visit our relatives. We will win more friends and partners with our own sincerity, integrity and impact. China will never harm neighbors to serve its own interests. China attaches great importance to strengthening economic links with other Asian countries. China has become the largest trading partner, biggest export market and important investor for many Asian countries. China contributes more than 50% to Asian economic growth. o A ‘Silk Road’ economic zone. o A ‘Silk Road’ using sea routes. o An Asian Infrastructure Investment Bank. o Upgrading the China-ASEAN Free Trade Area. o A Bangladesh-China-India-Myanmar economic corridor. o And a China-Pakistan economic corridor. These initiatives fully demonstrate China’s sincerity to create mutual benefit for all neighboring countries. These initiatives have been warmly welcomed by neighboring countries. China will stick to the principle of righteousness and carry forward its tradition of sharing. We will share opportunities and benefits with neighboring countries through deepening practical co-operation. China will provide more support to its neighbors. China’s interests and those of its neighbors will be more closely interwoven. The aim is to achieve common development and prosperity of China and its neighboring countries. This year, China will host the APEC Economic Leaders’ Meeting and related activities. We will take this opportunity to outline the vision for Asia Pacific long-term development. · Third, continue to safeguard peace and stability. We will deepen security co-operation with neighboring countries and contribute to solving hotspot issues in Asia. China will take up its responsibilities in maintaining regional peace. We have been an advocate of openness and inclusiveness. We insist on the principle of seeking common ground while shelving differences. We have made tremendous efforts to advance regional cooperation arrangements like 10+1, 10+3, East Asian Summit and Shanghai Cooperation Organization. These mechanisms have enhanced each other and are pivotal to maintaining regional peace and promoting regional development. China has taken an active part in defusing the Korean nuclear issue and Afghanistan issue. This year, China will host the 4th foreign ministers meeting of the Istanbul Process on Afghanistan. We will work to make this meeting successful and productive. The aim is to facilitate political reconciliation and economic reconstruction in Afghanistan. China is a champion of the new security concept that underlines mutual trust, mutual benefit, equality and cooperation. China will host the Summit of the Conference on Interaction and Confidence Building Measures in Asia this year. We will take this opportunity to deepen security co-operation with neighboring countries. Turning to the role of China with the United Nations. China is a permanent member of the UN Security Council. China will continue to play a constructive role. We will project China’s voice, put forward China’s proposals, contribute China’s thinking and make new efforts to safeguard regional peace and security. · Fourth, continue to build bridges of friendship by increasing people-to-people and cultural exchanges. We will endeavor to create a model of cross-cultural dialogue in Asia. Friendship between peoples is the foundation of relations between countries. In turn, friendship between peoples hinge on their mutual understanding. People of Asia have profound and proud civilizations. Over centuries, these different civilizations have enhanced each other and coexisted harmoniously in Asia. China will make greater efforts in public diplomacy, non-governmental diplomacy and people-to-people exchanges. We will encourage more exchanges between youth, think-tanks, parliaments, NGOs and social organizations among Asian countries. The aim is to make more friends, sow the seeds of kindness, and build a family-like neighborhood. We will align the ‘Chinese Dream’ with the people’s aspiration for a better life in neighboring countries and with the prospects of regional development. We want our neighbors to better appreciate that the interests of us all are closely interwoven and all countries in the region are highly interdependent. I have now reached the third question that is frequently asked about Asia. This is how to maintain the peace and stability of Asia? Asia is now the meeting place of interests of all kinds of stakeholders from across the world. Asia now holds sway in the evolution of global advance. A stable Asia means a peaceful world. A strong Asia means a prosperous world. In my observation, lasting peace and stability of Asia requires China’s efforts. At the same time it is essential that other countries in the region and powers outside the region work together towards the same goal. ‘Use history as a mirror’. In this way we can learn from the past and so travel forward with more clarity and certainty. The world needs to fully recognize Asian peoples’ tremendous contribution to the victory of the World War II against fascism. We should view sacrifice and sufferings by Asian people in the context of maintaining peace for all mankind. We should fully appreciate the importance of peaceful development to Japan and to Asia. · Japan should show its sincerity. 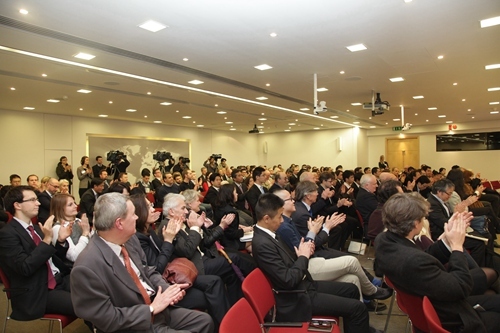 · Japan must willingly admit its past mistakes caused by its militarism. · And Japan has to earn the trust of China, Korea and other Asian neighbors with credible actions. Only when truly learning the lessons of history, can Japan’s relations with its Asian neighbors have a future and Asian people feel re-assured. We hope that some related countries will shoulder their responsibilities and learn from the lesson of appeasing Germany on the eve of World War II. We also hope that other countries will not attempt to have a foot in both camps and connive at Japan’s rising militarism. Otherwise, this risks taking Asia once again on a road into war and conflict. · The international community must resolutely oppose and condemn any words or actions to negate the outcomes of the global war against fascism. · The international community must challenge any moves to change the post World War II international order. · And the international community should work together to uphold the principles and purposes of the UN Charter. Only these principles can maintain stability of Asia and guarantee world peace. Let me now give you the second reason why regions and powers outside Asia should work together towards the same goal. All should fully recognize that our interests are intertwined and win-win cooperation will make us all winners. Asian countries are becoming increasingly interdependent. Our political and economic cooperation has great potential. Deepening mutually beneficial cooperation is the right choice for all Asian countries to achieve common development. We should bear in mind the fundamental and long-term interests of Asian countries. We should promote development through cooperation, enhance mutual trust through exchanges and raise the level of Asian collaboration. At the same time, countries in the region should properly handle differences through peaceful negotiation. We should explore ways to turn disputes on territorial land and sea from zero-sum games to win-win situation. In recent years, certain countries in the region have made unilateral provocations on disputed islands and hyped up a so-called ‘China threat.’ They have built up their military and so created regional tension. What they have done runs counter to the overriding trend of peace, cooperation and development in Asia. For various purposes, some forces outside Asia have taken partial positions. This has aggravated a complicated situation and escalated tensions. My message today is clear. China will not give up its lawful rights and interests, nor compromise its core national interests. Meanwhile, China’s door for dialogue is open. China has demonstrated sincerity of its commitment to peaceful solution of disputes. For example, we have reached agreement with Brunei and Vietnam on joint development and maritime cooperation. We have launched a negotiation process with ASEAN on COC. China hopes that the related countries will discard the zero-sum game mentality, work with us for the same goal. This goal is to maintain peace and stability of Asia. Now, I would like to turn to the third reason why regions and powers outside Asia should work together towards the same goal. We should uphold the new security concept featuring mutual trust, equality and cooperation. Asia belongs to Asian people. Asia also belongs to the world. The Pacific is vast. Asia is spacious. Asia’s peace and stability call for concerted efforts from countries in the region. It also requires outsides forces like the USA and Europe to play a positive and constructive role in Asian regional affairs. Asian countries should welcome this. At the same time, outside countries should also respect Asia’s diversity and its long standing traditions of co-operation. At present, Asia’s security faces new challenges. Hotspot issues flare up one after another. Both traditional and non-conventional security challenges create new manifestations. Without security and stability, there is no development to speak of. Countries inside and outside the region need to reject cold-war mentality and strengthen strategic mutual trust. Also, these countries need to advocate the concept of comprehensive security, common security as well as co-operative security. Countries should actively engage in cooperation while respecting and accommodating each other’s core interests and main concerns. We should make Asia a big stage, rather than a boxing ring. Still less should we favor the selected ones or gang up to serve selfish interests at the cost of Asia’s stability. China’s development cannot be achieved without the rest of Asia. Asia’s development also needs China. China is committed to the path of peaceful development and committed to comprehensively deepening reform and opening up. This will not only advance China’s development, but also create new and important opportunities for Asian stability and prosperity. A strong China will bring a strong Asia. A more successful China will make Asia more successful. China is a member of the big Asian family. We stand ready to work with our neighbors to achieve a new Asia of peace, development, cooperation and win-win.